Stephanie recently made her debut appearances in the UK earlier this year appearing on BBC Radio Scotland. She now releases her fifth album, but it almost never saw the light of day. She was signed with Equity Records which folded midway through the project. 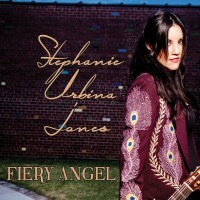 She is originally from San Antonio, Texas and this album showcases her Latin as well as her Country roots. She has a unique style and sound but covers both genres perfectly, from country-rock to Latin pop. The album opens with “Vamenos”. This actually manages to blend both genres but the majority of the album tends to steer towards country rather than Latin. She does country very well. Check out the gorgeous “Resurrection Of My Heart”. It really doesn’t get much better than this and this track deserves huge exposure. It’s not the only highlight however. “Rose In The Wreckage” illustrates the pain felt by her separation and eventual divorce. “Life’s Too Short” describes her way back and “Hold Me Till The Lonelies are gone” is a foot tapper with an uplifting theme. She returns to the Latin Vibes with the fun and very catchy “I Wanna Dance With You”. It’s well worth checking the video released for this song which is a Latin dance song shot in a country music dance hall! We are treated to a very faithful rendition of Kris Kristofferson’s standard “Help Me Make It Through The Night” before a tribute to her home state “He Reminds Me Of Texas”. There are 13 very strong tracks and a very enjoyable album which is well worth checking out. For followers of “The Voice” US version featuring Blake Shelton, you may remember Blake using a Stephanie Urbina Jones song when coaching winner Craig Wayne Boyd. He sang Stephanie’s “My Baby’s Got A Smile On Her Face” on the show and took the song to a top 3 spot on iTunes. Whilst this song isn’t featured here the profile created by the exposure on such an iconic show helped her to raise funds to release this album. I started by saying that the album almost never saw the light of day. It was partly funded by an INDIGOGO fund raising campaign that enabled the album to be released. She has a unique niche as she attempts to appeal to two entirely different music genres. Judging by the quality of the tunes on offer here she appears to be succeeding, from a country fan’s viewpoint.